Last year was the deadliest for journalists in Cambodia since 1997, according to a report released by the Cambodian Center for Independent Media on Thursday, but most of the media professionals surveyed by the organization believe that the industry is heading in the right direction. Opposition leader Sam Rainsy said Wednesday that he has convinced his deputy Kem Sokha to end his recent attacks on the government, hours after Prime Minister Hun Sen warned that the new “culture of dialogue” between the CPP and CNRP will be abandoned unless Mr. Sokha tones down his rhetoric. Prime Minister Hun Sen on Wednesday announced that he would replace CPP President Chea Sim if the ailing octogenarian were to pass away, and promised to maintain his three-decade hold on power as the ruling party’s candidate for prime minister in the 2018 national election. 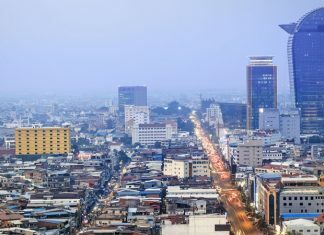 Posts and Telecommunications Minister Prak Sokhonn estimated Monday that the number of Internet users in Cambodia would reach 9.5 million by 2020. At a special public meeting with opposition leader Sam Rainsy in Kuala Lumpur on Saturday, Prime Minister Hun Sen acknowledged that Mr. Rainsy could replace him in 2018, but warned that CPP-loyal “forces” would prevent any acts of revenge Mr. Rainsy planned in such a case. Funcinpec leader Prince Norodom Ranariddh and second vice president Nhiek Bun Chhay left for China on Sunday to meet with officials from the Chinese Communist Party, the Cambodian royalist party’s longtime benefactor and supporter. A woman in Kampot province who allegedly decapitated her father and murdered her sister in a fit of rage on Tuesday evening was questioned by the provincial court Thursday, police said. The son of a wealthy property developer was charged Wednesday by the Phnom Penh Municipal Court after assaulting the son of logging tycoon Try Pheap in a tattoo parlor on Monday night, according to police. The son of a wealthy property developer and police general was arrested Monday evening after attacking another rich, young businessman inside a Phnom Penh tattoo parlor, military police said Tuesday. Upon officially taking the helm of the country’s revamped National Election Committee on Monday, Sik Bunhok promised to follow in the footsteps of the outgoing committee members, most of whom were widely lambasted as tools of the ruling CPP. After about 70 villagers and environmental activists spent the weekend trying to drive away sand-dredging barges they claimed were illegally operating off the coast of Koh Kong province, a local official said Monday that he had ordered a brief suspension of all dredging in the area. An environmental activist and a fisherman said Sunday that about 70 residents of Koh Kong province had worked together over the past few days to chase away sand-dredging barges they accused of operating illegally around Koh Kapi island and damaging vital fishing grounds. The new National Election Committee, a key pillar of last year’s political deal between the CPP and the CNRP, will formally assume its duties as the country’s election-organizing body this morning after almost nine months of negotiations and preparations. A month after Prime Minister Hun Sen issued a directive ordering government bodies to put a halt on new hires—except to fill vacated positions—the Ministry of Public Function has authorized state institutions to hire 5,001 civil servants to replace those who had recently retired, quit or been fired, according to a statement released Tuesday. The ruling CPP and opposition CNRP made a rare show of fraternity Wednesday morning in unanimously passing the country’s first tobacco control law—which bans sales to minors, smoking in public and most advertising—in a bid to combat related illnesses. Prime Minister Hun Sen said Sunday that lawmakers must pass a controversial law on NGOs in order to prevent funds from terrorist groups such as al-Qaida from seeping into the country. Representatives for some 200 families in a yearslong land dispute with the Union Development Group in Koh Kong province met for the first time with both company and government officials Tuesday but left with little to show. Deputy opposition leader Kem Sokha told supporters Monday that the CNRP’s 55 lawmakers will soon ask to revisit the three controversial judicial reform laws passed by the National Assembly last year during the opposition party’s post-election parliamentary boycott. Prime Minister Hun Sen on Thursday took aim at the Global Teacher Prize, a major new award that a Cambodian teacher was recently shortlisted for, saying that the competition might have been rigged in favor of the U.S. winner. Prime Minister Hun Sen on Wednesday called on his ruling party to give its staffers a base salary on par with the country’s lowest paid teachers plus 30 percent, roughly matching the raises teachers, nurses, police and soldiers will be seeing this year.